The drought that hit the south-east of England in 2006 had a serious impact on water supply. People were being urged to conserve water and in some regions hosepipe bans or, in areas of severe shortages, drought orders were put in place to restrict the use of water, which in some cases can have a serious impact on livelihoods. Clearly, for the public to accept such restrictions there is a need for those affected to understand what causes drought and why the restrictions have been put in place. In many regions of the UK groundwater is a major source of water. In the south-east it forms the main source of drinking water, even more so during drought periods (during the summer of 2006 more than half the water supply for the whole of the UK is groundwater). 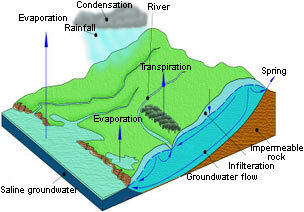 Groundwater resources are recharged by rain that falls during the winter. During the summer when evaporation is high and plants use lots of water to grow, little of the rainfall will make it through the soil into the aquifers below (permeable rocks from which water can be pumped). The winters of 2004 and 2005 were both relatively dry and as result there was little groundwater recharge; heavy rains in the summer months normally have little effect on groundwater resources (e.g. May 2006 was the wettest May in England and Wales for 27 years but had limited benefit). However, not surprisingly, many people don't understand why, when we have a very wet period during the summer months drought restrictions can remain in place. This highlights the need for better understanding of how our groundwater systems work. A highly effective way to inform people about groundwater would be whilst they are at school. The UK Groundwater Forum aims to raise the awareness of groundwater and has in the past produced ad-hoc education material aimed at older schoolchildren. However, it was felt necessary to have a more strategic approach to raising schoolchildren's awareness of groundwater and so the Forum commissioned the Earth Science Education Unit at Keele University to undertake a review of groundwater education in schools. The results of this have greatly concerned the Forum's steering committee. The review has shown that groundwater receives very little attention up to the age of 14. The water cycle forms part of the relevant curricula in all parts of the UK but the subsurface part of the cycle is typically ignored. Even where rivers are included, groundwater, which sustains river flows during summer months, is often not mentioned. Sustainable development is a major element of science, geography and environmental science curricula and one of the key issues facing the UK. The balance that needs to be found between the exploitation of water resources and the sustainability of the environment is crucial, particularly in the context of climate change. This issue is not covered in the curricula. Indeed, water resources in general – their nature and their occurrence - are poorly addressed. So what can be done to give the study of water resources, and groundwater in particular, the importance it deserves? It is the contents of the curricula, schemes of work and exam specifications that determine what is taught in schools. Although water resources are currently addressed to some degree the profile needs to be raised. They should be mentioned explicitly in the curricula, schemes of work and exam specifications where there is the requirement to study natural resources and their sustainability. Similarly groundwater should be mentioned explicitly in the context of the water cycle and river flow. These topics are currently covered but, perhaps because groundwater is out of sight and poorly understood, its important role is ignored. In order to achieve these ends the Forum Steering Committee plans to lobby the curriculum authorities in the UK. We also intend to approach publishers to encourage them to give more coverage of groundwater in their textbooks and hope to be able to provide the support for this to be achieved. Some teachers may have insufficient understanding to include groundwater in their class work. Although a major undertaking, the Forum hopes to be able to secure the funds to initiate continuing professional development opportunities for teachers. As our climate changes our water resources are likely to become threatened and we foresee major difficulties in convincing people of the need to reduce their water demand and to understand what these changes mean for the environment. Schools provide an ideal place to raise the public awareness of groundwater and the UK Groundwater Forum hopes the initiative will allow this to become a reality.